Cast your mind back to the turn of the millennium. A time when we first came to grips with Big Brother, a time when the Millennium Dome was revealed to a semi-astonished English public and a time when Ipswich Town briefly became the talking point of English football. Managed by Scotsman George Burley, the Tractor Boys went from playoff champions in 2000 to challenging for the top four in the Premiership in less than a year. What’s more, they did so on a shoestring budget. Sadly for the Tractor Boys their time in the sun was not to last and by 2002, they found themselves back in Division One. The early-2000s saw the Suffolk side experience both the highs and lows of English football in quick succession. 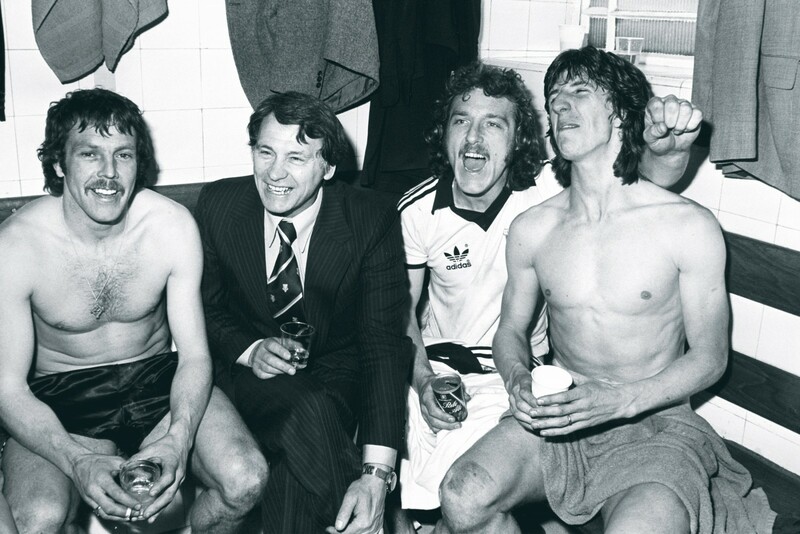 Ipswich’s route to the Premiership had been a long, drawn out battle. For three seasons, the club flattered to deceive, crashing out in the playoffs in as many years. It was for many a Sisyphean task and entering into the 1999-00 season, you would have forgiven fans for doubting their beloved team. The summer had seen the aspiring side lose their star player in Kieron Dyer to Premiership side Newcastle United for £6 million, less than half of which was re-invested into the side. Dyer had been the focal point for Ipswich’s attack the previous season, regularly separating Ipswich from their rivals. In his formative years with the side, the creative midfielder had twice made the Division One Team of the Year. His loss had the potential to buckle their top flight aspirations. Like the alchemists of old however, manager George Burley managed to turn coal into gold. Galvanising his side around the previous year’s playoff heartbreak, the Scotsman managed to piece together a starting line-up teeming with determination. The first month of the 1999-00 campaign set the scene for the Tractor Boys, with the side winning four of their five matches. The attritional nature of Division One football soon slowed down the Suffolk side’s march to promotion but at the end of the season they sat in third place, two points off second. It was a fine finish, but one that even the most optimistic Ipswich fan wanted to avoid. Third place would mean the playoffs. When Ipswich lined out against Bolton in the semi-finals, it was the fourth time in as many years that fans were subject to the game of roulette. To make matters worse, the side had crashed out in the semis the previous season to Bolton. Many feared history would repeat itself and a 2-2 draw at the Reebok Stadium meant both teams travelled into the second leg with everything to play for. For the neutral, the second leg was pure entertainment. Tackles flew in, goals came in quick succession and both sides attacked in a sheer frenzy. For the interested fan, the game was a nightmare. Goals were exchanged so regularly that when the referee blew his whistle at 90 minutes, the score stood at 3-3, forcing extra time. Ipswich eventually finished the game out 5-3, proving that fortune eventually favours us all. The playoff final would see Ipswich face Barnsley in an equally exciting affair. Putting past play off performances aside, Burley’s side dominated their Yorkshire opponents from the opening minute, winning the game 4-2 meaning that at the fourth time of asking, the Tractor Boys had finally made it to the Promised Land. Given the tendency for many newly promoted clubs to spend money with the same enthusiasm as a Russian oligarch, it may come as surprise to learn that Ipswich were relatively conservative in the weeks leading up to their Premiership campaign. Perhaps on the understanding that a side’s morale is more important than a risky signing, Burley expended more energy tapping into Ipswich’s youth prospects than finding foreign gems. Indeed, most of the money the club spent went to English prospects from the lower leagues, as a certain Titus Bramble rose up through the academy. The best the side could muster in terms of top flight pedigree came in the form of Hermann Hreidarsson from Wimbledon. The fact that Hreidarsson’s last two employers, Crystal Palace and Wimbledon, had been relegated from the Premiership during the defender’s time at the clubs did little to inspire confidence in the fans. Remarkably, however, it appeared that the side’s miserly approach to the transfer market was the right course of action. Despite an opening day defeat to Spurs, match reports couldn’t help but gush over the “spirited Ipswich play” and the pedigree of new signings like Titus Bramble. Burley was onto something it seemed. Town’s next match saw them draw 1-1 at home to a Manchester United who just two seasons previously had won the elusive treble. The Ipswich story was beginning to take off but it wasn’t until a 2-1 victory away to an injury ravaged Leeds United side that the world of football began to take real notice of Burley’s side. The win at Elland Road epitomised everything the Tractor Boys had to offer that season. They were resolute in defence, tenacious in attack and above all else, determined. When Jermaine Wright put Ipswich ahead after 46 minutes, his side managed not only to hold on, but to dominate a team that would later that season reach the semi-finals of the Champions League. The win at Leeds was followed by a hard fought draw with giants Arsenal. 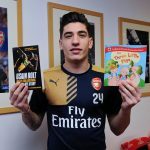 The match reports from the Arsenal game revealed the extent of Town’s ability, with many reporters expressing their incredulity that Arsenal had been lucky to gain an equaliser. As the season continued Ipswich’s manner of play became more and more deadly. Aggressive in their approach, they were never content to sit back and wait for the opposition. Hassling your opponent was the play of the day. Of the 57 goals Burley’s men scored that season, 18 came within the first ten minutes of kick off. Opponents clearly struggled to match the side’s enthusiasm. The 13 games after the Arsenal result read eight wins, two draws and three losses. 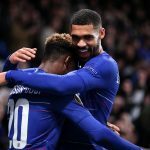 By January the side had reached the much sought after 40 points that it’s said all promoted teams must reach to ensure their survival in the top flight. There was just one problem: Ipswich weren’t worried about survival. They were interested in winning and nothing else. For much of the season, Burley’s side occupied a place in the top five of English football; not bad for a side many tipped to be battling relegation at the beginning of the season. It wasn’t until February that the first real signs of a stumble in their ascent to the top were evident, as the toll of top flight football began to affect a 23-man squad. Indeed, Ipswich’s three losses in a row is all that needs to be said about that month’s endeavours. Luckily for the fans, a 3-1 comeback victory over Bradford City managed to re-energise the side to continue their climb up the table. The next nine games would see the surprise package of the season accrue 19 points – and on the last day of the season Ipswich were still in contention for a Champions League place. The last few seasons have seen newly promoted sides challenge the top half of the Premier League but few have dared to dream of a Champions League spot. Sadly a draw at Derby meant that they would have to settle for fifth place. Settle being the key word. Ipswich finished the season on 66 points, just 14 off eventual champions Manchester United. George Burley scooped the Manager of the Year Award and striker Marcus Stewart finished as the second highest goalscorer in the league, ahead of more familiar names like Thierry Henry, Michael Owen and Teddy Sheringham. 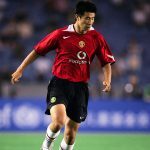 In the history of the Premiership, no promoted team had ever been so successful and with news that Burley would finally have money to spend, fans of the club looked forward to the 2001-02 season. In all fields we encounter the notoriously difficult follow up act. Your debut performance has amazed and inspired both critics and fans alike, but now you must follow up with something better. Sadly, oftentimes the follow up leaves a lot to be desired. Ipswich’s season following their fifth place finish was to football what The Stone Roses’ Second Coming album was to music. A flat performance that truly epitomised second season syndrome. This was despite the fact that George Burley had decided to spend some of his new found cash in the summer of 2001 with players such as Finidi George, Marcus Bent and Matteo Sereni being brought in for big money. Through a combination of tiredness, bad luck and substandard decision-making, Ipswich would spend most of the 2001-02 season battling relegation. When the 2000-01 season saw Ipswich battle Spurs in the opening game of the season, a marker was laid down by the Tractor Boys that they meant business. The following year Ipswich signalled that they were no longer the dangerous wildcard in the top flight. An opening day defeat to Sunderland saw a botched Titus Bramble clearance eventually lead to a Kevin Phillips goal. A victory over Derby in their next game was quickly followed by a 1-0 defeat to Charlton. Injuries did little to help matters. Ipswich soon saw both Finidi George and Marcus Stewart out for two months with injuries. The additional strain of European football saw a shoestring side run out of gas only a few months into the season. Off the field matters were hardly better. A decision to revamp the club’s North Stand saw diehard fans of the club disbursed around other sections of the stadium, meaning that the once vocal twelfth man at Portman Road soon was no more. A brief revival in winter, when the club won seven of eight matches, was curtailed by a 6-0 defeat to Liverpool. Every time Ipswich appeared to be turning a corner, defeat brought fans back to reality. The Liverpool defeat sent Burley’s side into a nosedive, with the club collecting just six points from its final twelve matches. Relegated that season with 36 points, Burley’s side were condemned to back to Division One and have been trying to escape back to the Promised Land ever since. Despite brief glimpses of success during the 2001-02 season, notably a 1-0 home win over Inter Milan in the UEFA Cup and a 5-0 mauling of Sunderland two months later, Ipswich were faced with the ignominy of returning to the First Division, just one year after finishing fifth. 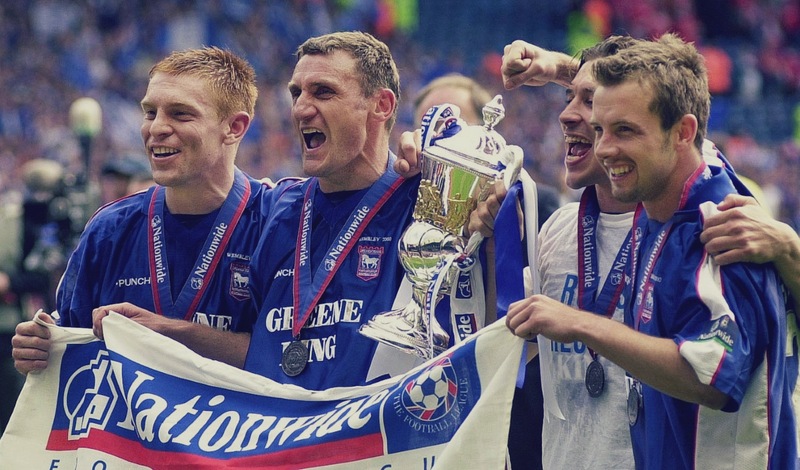 Their time in the spotlight may have been short, but for one brief moment in 2001, it’s no exaggeration to say that Ipswich Town were the talk of English football.